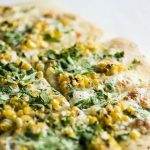 This easy homemade cilantro corn pizza recipe is perfect for summertime! 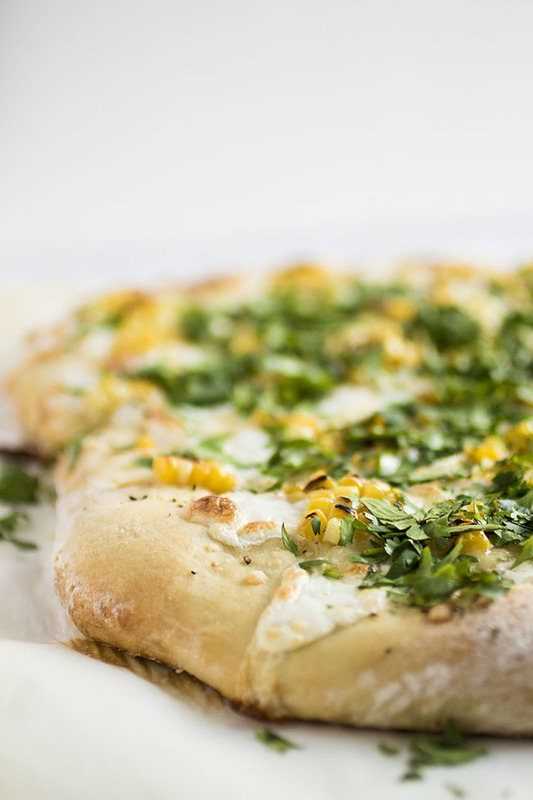 Grilled sweet corn, fresh cilantro, and homemade pizza dough with gruyere cheese and fresh mozzarella. Vegetarian. 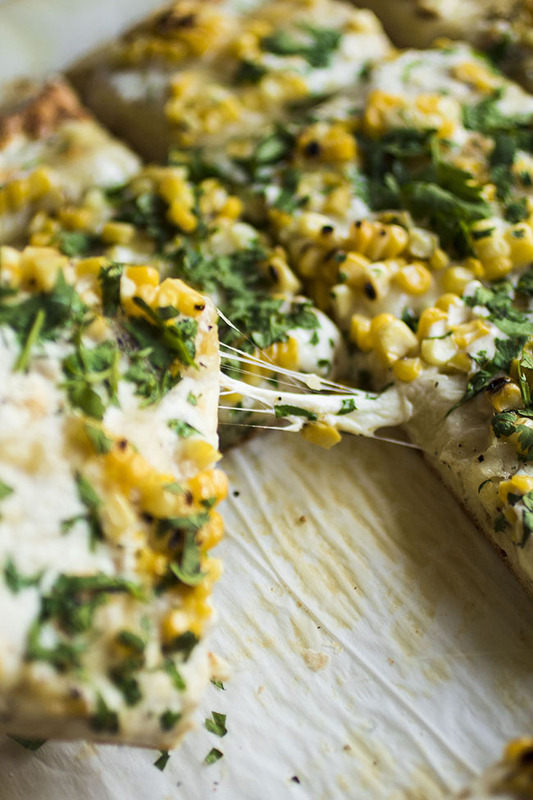 PS – If you’ve never made homemade pizza before, 1) YOU ARE MISSING OUT and 2) I’m going to need you to drop whatever you’re doing (liiiiiiiike, IMMEDIATELY) so that you can get some o’ this cilantro corn pizza in your life ASAP. I used my favorite 15 minute pizza dough for this recipe, and our cheesy superstars here are gruyere and fresh mozzarella. 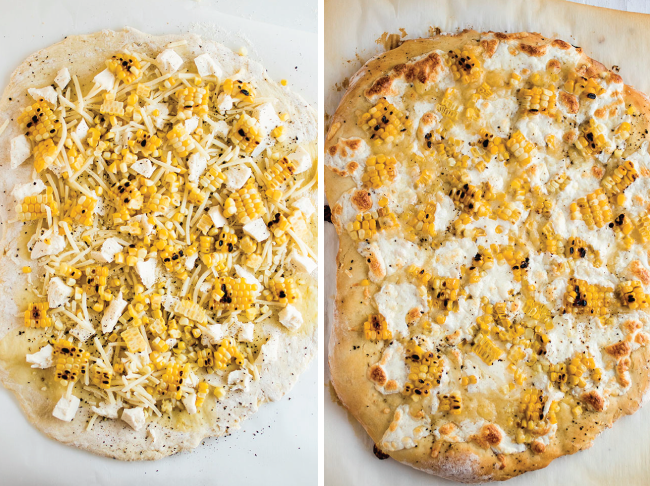 The gruyere gives the perfect amount of bite and depth to this simple corn pizza, and the mozzarella gets all niiiiiiiice and creeeeeeeamy and perfectly browned up in the hot oven. 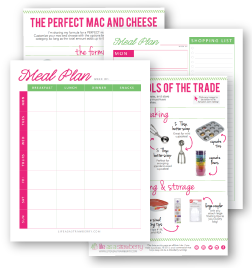 Preheat your oven (get it HOT HOT HOT) with an inverted baking sheet sitting on the center rack. I use an inverted baking sheet because 1) I have no pizza stone because 2) I think single-use kitchen things are dumb. Use a thick, sturdy baking sheet and you’ll get that nice crispy pizza crust we all know and love! Roll out the pizza on a piece of parchment paper so you can easily slide it on and off the hot baking sheet. Hmm. I guess that’s it, actually. SO SIMPLE. PPPS – If there are only two things on a list, does it still count as a “list?” Or is just, like, “some stuff you wrote down”? 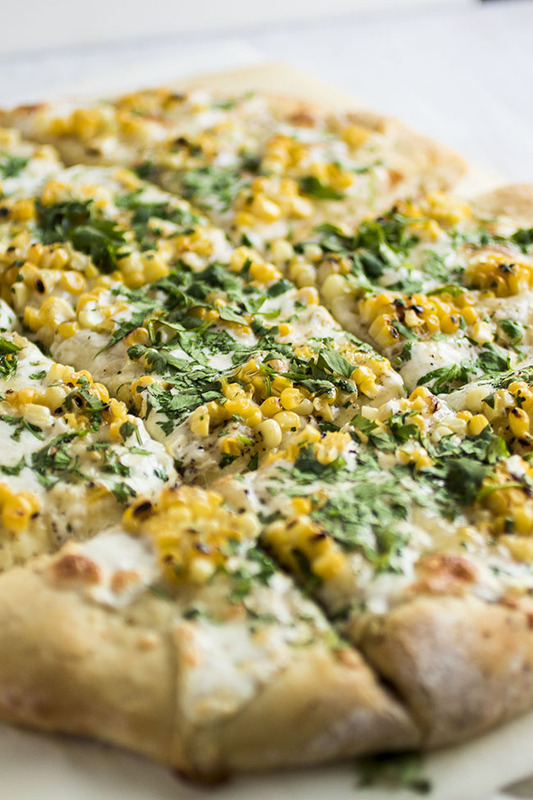 This cilantro corn pizza is the perfect bite of summertime. 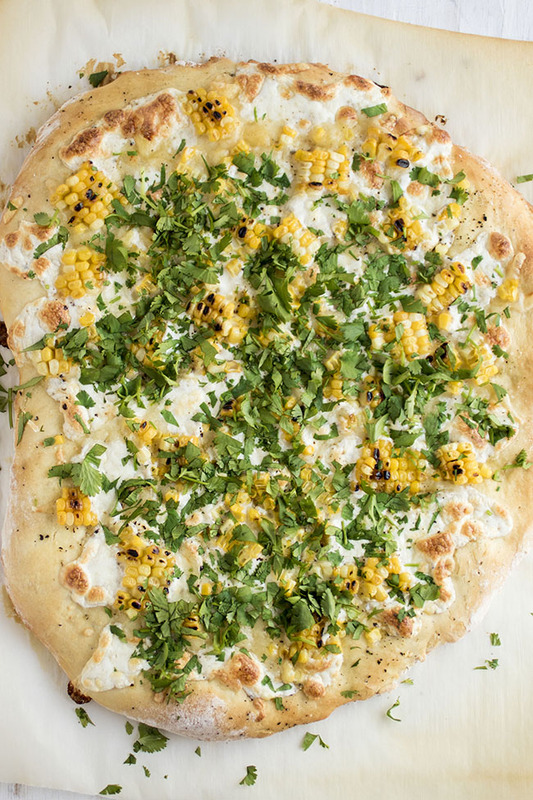 Grilled sweet corn (which is basically like candy, LET’S BE REAL) and fresh cilantro are all you really need to bring this pizza – this ‘za, this pie, this tasty cheese wheel – to the happiest of flavortowns, but you could add to it however you like! Jalapeños, tomatoes, more herbs, bacon, spicy Italian sausage – all delicious things are welcome here. A quick and easy summertime pizza. Place a large, sturdy baking sheet bottom-side-up on the center rack of your oven (you could also use a pizza stone if you have it) and preheat oven to 450 degrees F.
Lay a piece of parchment paper over a large cutting board and lightly dust it with flour. Roll out your pizza dough on the parchment paper until it’s at your desired thickness – don’t worry if it’s not perfectly round! I like my pizza crust fairly thin, so I roll it out to about 1/3″ thick. Drizzle olive oil over pizza dough, then top with shredded gruyere and torn mozzarella cheese. 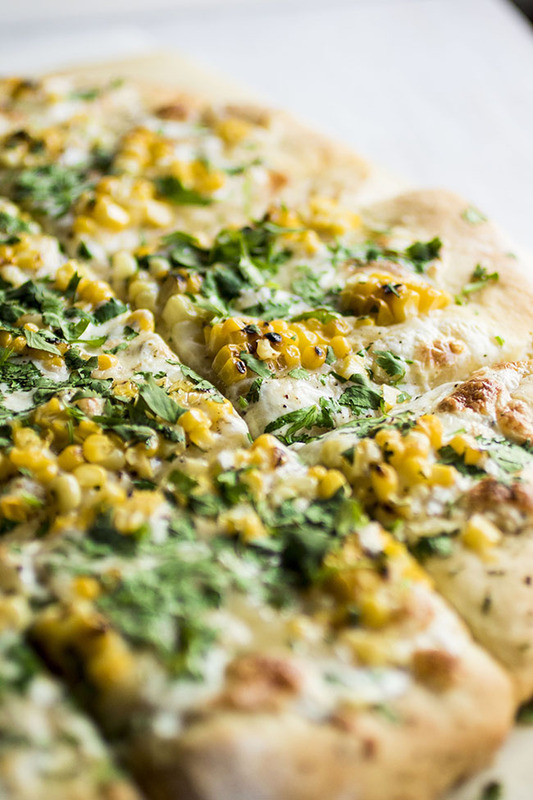 Add a sprinkle of salt and pepper to pizza, then top with grilled corn kernels. Bake for 15-20 minutes until cheese is melted and crust is golden brown. Let pizza cool for 5-10 minutes, then top with chopped cilantro, slice, and serve immediately. This pizza is a great blank canvas food! Add bacon, jalapeños, chorizo, roasted red peppers, additional herbs, tomatoes, or whatever else you’ve got on hand to make it your own. If fresh sweet corn isn’t in season, frozen corn kernels are fine. Use a rolling pin to roll out your pizza dough, or stretch it out with your hands if you prefer. If you have a pizza peel (you lucky duck!) roll the pizza out on the pizza peel instead of a cutting board lined with parchment paper. If you’re feeling ambitious, brush the pizza crust with a bit of melted butter or olive oil before baking. This will give you a shinier pizza crust.